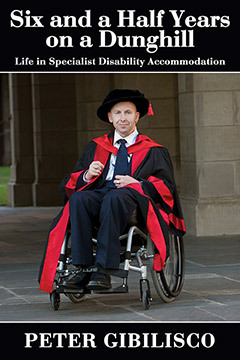 Dr Peter Gibilisco's doctoral thesis, The Political Economy of Disablement: A Sociological Analysis, argues that people with disabilities experience profound social exclusion as a result of the prevailing economic theories which emphasise free markets and mutual obligation. "Obtaining self-esteem, social inclusion and empowerment remain key struggles for people with disabilities," he says. "Only in a system where there is significant government intervention in social and economic policies can people with disabilities be truly empowered. My aim in this book is to affirm vital principles that must be better understood and implemented if the National Disability Insurance Scheme (NDIS) is going to be of benefit and fulfill its mandate; so that care doesn't become careless. I want to encourage people to keep on pushing the case for disability justice! My book is aimed at those providing a service to people with disabilities with high support needs. I want to address all who are involved in disability care; professionals, social workers and especially those managing facilities that look after communities and groups of people. I am giving myself a wide focus in this book, and my aim is not to win a fight, but to present a case. '6 and ½ years On A Dunghill' is another significant contribution from Dr Peter Gibilisco to the ongoing struggle for social, political and economic justice in the context of people with disability. Mobilising a sociological worldview, Peter Gibilisco draws on his personal experiences, as well as the experiences and insights of others, to highlight profound policy and structural challenges and constraints in the disability sector, and in society more broadly, that impact negatively on people with disability. At the same time, he provides important insights into pathways forward, based on a strong conception of the need to create an inclusive society. In particular, he highlights the importance of action around synergy, altruism, passion, empathy and pragmatism as providing a means of moving towards a more socially just and inclusive society. I recommend this important book authored by Dr Peter Gibilisco to all people interested in the struggle to create a socially, politically and economically just society. Written with clarity and first-hand insight, '6.5 years on a dunghill' tackles some incredibly important challenges for people living with disability. Peter Gibilisco writes of his experience living with a disability and fighting for his rights. It is a remarkable insight into the frustrations of dealing with bureaucracies for those with disabilities. Peter describes his experiences and his views on how the lives of those with a disability can be improved by changing processes and removing barriers. Peter is to be congratulated on this very important work. I have worked with Dr Peter Gibilisco over a period of about 15 years. Over that time I have watched Peter’s amazing perseverance, admired his intellect and wondered at his ability to dispassionately scrutinise the situation in which he finds himself. In this book you feel his frustration and raw pain as he critically discusses being disenfranchised by the system that is meant to care for our disabled citizens. This book gives an insight into the true grit of the man and his selfless willingness to take up the fight for the benefit of others who find themselves without a voice. I can commend this book to anyone with an interest in our disability care sector. Peter’s experience and knowledge provides insight into how people with disabilities are faced with growing struggles, almost on a daily basis. I believe this book is an excellent depiction of the current state of affairs concerning social exclusion in today’s community. I recommend this book to anyone interested in finding out more about the political and economical landscape of today’s disability sector. Dr Peter Gibilisco is a social justice activist who speaks from the dual perspective of a successful academic together with the lived experience of a progressive neurological condition which is having an increasingly devastating impact on every aspect of his life. This book will strike a chord with people who have disabilities everywhere especially those with severe physical disabilities living in shared supported accommodation facilities. With great intelligence and integrity it describes the mental torture associated with a disintegration of control and individuality worsened by factors as fundamental as a lack of empathy and continuity in the caring relationship. It gives voice to serious shortcomings in a system that is failing many in the provision of truly individualised care. Friedreich’s Ataxia does not affect my intelligence, but many working in the disability sector act as if they do not believe this. But the reality can be highlighted by my academic qualifications, which are a double degree from Monash University, Master of Arts from Monash University and a Doctor of Philosophy from University of Melbourne. My PhD was achieved late into the pro- gression of my disease, when I was 43 years old. Many say to me that this was a huge achievement, and I am aware of some taken-for-granted misunderstandings about Friedreich’s Ataxia. At the time of my diagnosis when I was 14, medical specialists told my parents that ‘I would not live much beyond the age of thirty’. One can only imagine their response if they were then told I would obtain a PhD! These days, I still perform research and Melbourne University gives me honorary fellow status. I have written and published over 100 articles and currently have now authored three books. However, there are many degrading effects to be battled with, such as blindness, very poor speech, hearing impairment, poor heart and limited mobility and coordination. But in all spheres of life, I’ve always tried my best; the jury is out, but there is still some chance that my writings may create positive change. This book has been achieved with the assistance of two very good friends, Bruce Wearne and Christina Irugalbandara. Copyright © 2012-2019 Peter Gibilisco.